The Apostle Islands National Lakeshore is a 22-island archipelago on the South Shore of Lake Superior. It is known for its red sandstone sea caves, sandy beaches, picturesque lighthouses, and historic shipwrecks. 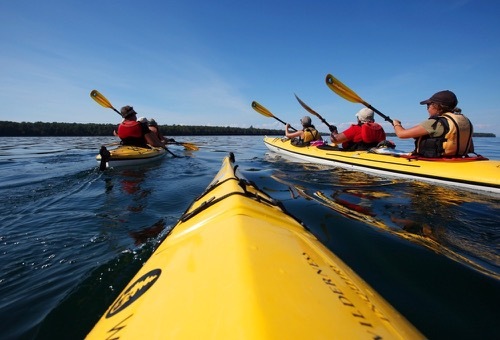 Sea Kayaking in the Apostle Islands is great for both novice and experienced paddlers. 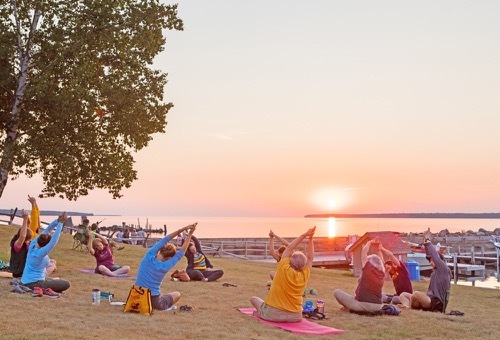 There are also plenty of opportunities to hike, play on the beach, sight-see, camp and enjoy the rhythm of the world’s largest freshwater lake. All trips begin at our Little Sand Bay camp. Check out this short video of the camp. The Apostle Islands National Lakeshore lies in the northwestern Wisconsin waters of Lake Superior, the largest freshwater lake in the world. Our Little Sand Bay Base Camp is immediately adjacent to the Apostle Islands on the South Shore of Lake Superior. The area is an enticing mix of rolling hills, sandstone cliffs, sand beaches and a 22 island archipelago covered with a beautiful mix of northern hardwood and boreal forest and laced with streams, waterfalls, and wetlands. The town of Bayfield, Wisconsin, is the jumping off point for your adventure in the Apostles. Visitors can find a variety of scenic features on the islands. These include pristine stretches of sand beaches and coves; spectacular sea caves; some of the largest stands of remnant old-growth forests in the upper Midwest; a diverse population of birds, mammals, amphibians, and fish; and the largest collection of national register lighthouses and lighthouse complexes in the entire national park system. 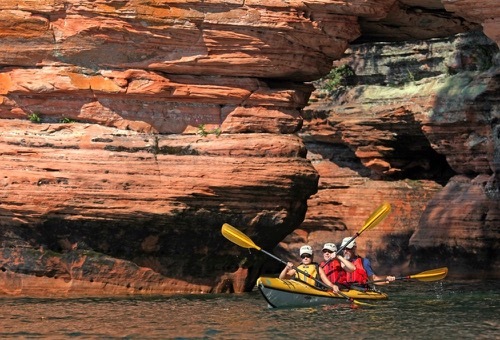 We have several different itineraries for the Apostle Islands because there is so much to see and do there! 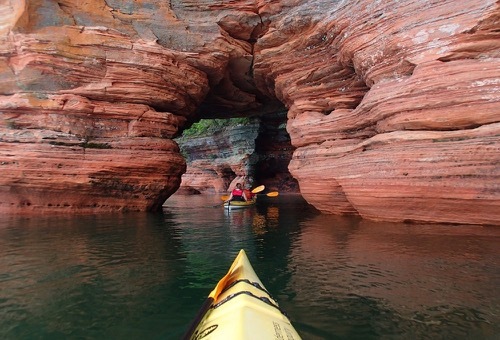 The best itinerary for seeing the most of the area is our most popular Apostle Island Base Camp and Kayak Tour. This experience stays at our beautiful and strategically located Little Sand Bay Base, and does a series of day trips from there. The advantage to this is you do not have to make and break camp every night. Instead, you can spend your time exploring the magnificent Mawikwe Bay Sea Caves by kayak and hike, paddle to see shipwrecks from a different era, kayak to Sand Island and visit more caves, Justice Bay, and the incredible Sand Bay Lighthouse. Our family trips are similar but geared to a different pace for families, including more S’Mores and a more relaxed agenda. 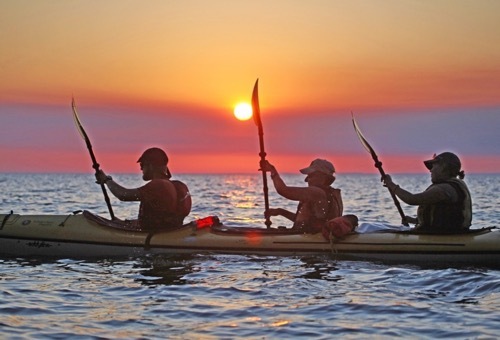 On the other end of the spectrum, if you want to get out and camp and paddle between the islands you will enjoy our 5-day Apostle Island Kayak Island Camping trip. On this trip, you will pack all of your food and gear into our custom made Current Designs Libra kayaks and travel out to Sand, Oak, Manitou, Devil’s, Stockton and other Islands. Spend your evenings at beautiful National Park Service camping sites and enjoy the stars and campfire. 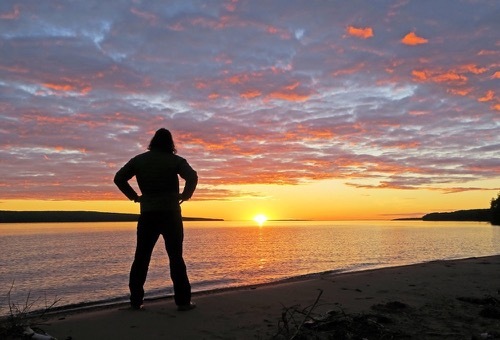 We also do a custom 7-day Apostle Islands Outer Island Expedition if you want to extend your trip and travel further. You will need to find at least 5 like minded paddlers for us to do this with you. We’ve developed some cool food and drink based itineraries that operate out of our Little Sand Bay Base Camp. 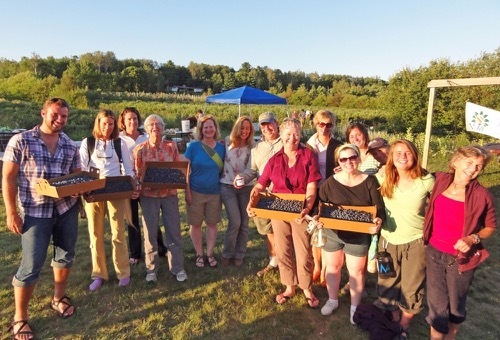 The original A Taste of the Apostles Islands with Beth Dooley is a popular culinary tour of local and organic foods produced on the Bayfield Peninsula. Famed James Beard award-winning author Beth Dooley is the master-mind and hoist of this wonderful trip. You will kayak to the caves, shipwrecks and beaches, and enjoy delicious and healthy meals, wine, beers and spirits. 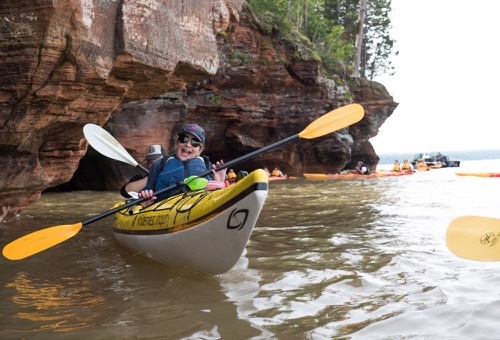 We have a mini version of this trip called Apostle Island Paddle, Pinot and Porter, which, as the name implies, focuses more on adult beverages. You will do many outdoor things on this trip as well, plus unique tours like the recently opened Copper Crow Distillery in Red Cliff. Last but not least, for those of you who want to stretch and hike we have two more great options. The first is our Base Camp Kayak and Yoga adventure. On this trip long-time WI instructor and Yoga Master Rebecca Barnes will lead you on both and internal and external journey that you will love. No experience needed! Our newest itinerary addition is our South Shore Hike and Explore. This adventure, based out of our Little Sand Bay Base, happens in the fall and takes advantage of the many beautiful hikes in the Bayfield Peninsula. Walking through the brilliant colors of fall foliage above the sea caves or on the way to Lost Falls is a great way to spend a fall weekend. Whichever trip you choose, you will enjoy the beauty of the area, the quality of our equipment, our wonderful staff and great food. Temperatures in the summer and fall months range from 45 F to 90 F. Rainfall can vary, but you should expect at least one day of rain. Weather in the area is strongly influenced by Lake Superior and can change suddenly. The terrain and landscape of the Apostle Islands is made up of red sandstone, covered with a mixed forest of birch, pine, oak, and maple. Except for a few cliffs, the terrain is gentle and rolling. 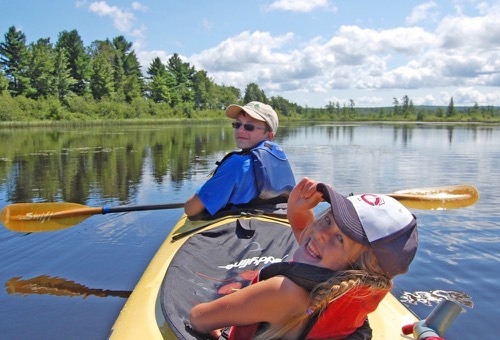 Most of your time is spent along the beaches and shorelines of the Apostle Islands National Lake Shore, kayaking to the shipwrecks and the sea caves in our sturdy and comfortable sea kayaks. We have several routes to choose from, each revealing a different dimension of this archipelago. Wind and weather largely determine the route, and storms may delay paddling. The unique geological features, rich cultural heritage, and diverse ecological system of the Apostle Islands have attracted visitors for centuries. One story says that early Jesuit missionaries, believing that there were only 12 islands in this 22-island archipelago, named the region after the twelve apostles in the Bible. The history of Apostle Islands National Lakeshore predates these missionaries by eons, however, as the region’s bedrock can be traced to Precambrian times. Nearly a billion years ago, sand and silt were deposited in this region via northwesterly flowing streams and rivers. Under the weight of additional layers, the sediment slowly compacted and began to bond together. These layers eventually experienced tremendous pressure as the ice age began and glaciers thousands of feet thick covered the forming sedimentary rock. The cycle of advancing and receding glaciers continued to shape the Apostles landscape until 10,000 years ago when the last of the glaciers finally receded. Although the glacial activity formed much of what we see today, other dynamic processes continue as differential erosion alters the islands’ beautiful sandstone arches, pillars, and caves. These geologic wonders are partly responsible for attracting the native inhabitants and present day visitors. The Anishinabe (also called Ojibwe, or Chippewa) were the most recent native people to inhabit the islands. Hunting, fishing, and maple sugaring provided food and supplies, and were eventually traded with the Europeans. During the mid-1800s the islands’ resources attracted European settlers and for 80 years these resources were seriously exploited. Brownstone was quarried and used to construct buildings and lighthouses, some of the forests were cleared and turned into farmlands, commercial fishing increased, and mills and mines were established. By the time of the Great Depression in the 1930s, the islands’ natural resources were scarce. While unfortunate for the people of the United States, the Depression saved the archipelago as it all but stopped development of the islands. Congress designated the Apostles as a National Lakeshore in 1970; in 2004, Congress further designated 80% of the Apostles as the Gaylord Nelson Wilderness, named after Wisconsin’s great conservationist and former Governor and U.S. Senator. The Apostle Islands National Lakeshore encompasses over 69,000 acres, of which 27,000 acres are submerged lands in Lake Superior. The National Lakeshore includes 21 of the 22 islands in the archipelago, plus a 12 mile long narrow strip of mainland shoreline. The islands range in size from Stockton Island at 10,000 acres to the tiny 3-acre Gull Island. Today, the National Park Service manages the Apostles Islands. The rare combination of remote but accessible scenery, geography, and both open and protected waters affords unparalleled freshwater sailing, boating, sea kayaking, and fishing opportunities. Ecological succession has returned this system to a natural balance and visitors enjoy abundant wildlife, heavily forested islands, beaches, and geologic wonders worthy of the Park Service’s protection. Join our email list to be the first to know about our trips and events.